Grats to everyone getting black cards. 3 ancient coin seal draws, 3 dupes. Two more normal draws, one dupe, and the happy prince. I think I'm done. Wish I had saved my diamonds and coins. 10 draws, 5 new cards. Started with 165 coins, only enough for 1 draw and got my third LuBu, a fresh start indeed. Got greedy later on and went for 4 seal draws to get 40 more coins, a few dupes and fortunately got Florice out of the junks. 1 more coin draw and was expecting my 4th LuBu from it, lo and behold Arthur came to save the day! Just the card I wanted, all there's left to do is to gather the other specialized cards for Arthur and it'll be gucci. Made it to 50 diamonds, made a 10 card pull, got all dupes and off course not even dupes that help with a VR or some sh*t, like all lame dupes. The proceed to spend my 5 ancient seal chances, got Arthur, Maya, Azazel, Fire Bride (all mew) and dupe Ao Gang in such order. Half my brain suspects that the dupe ao gang came from the coins earned on the 10 pull, the other half thinks i needed to be humilliated first to get good stuff on the ancient draw. I´m a long time FTP player and I´ve been very unlucky with special seals. Only have Chessia, Merlin, LuBu and Lynx as rares. 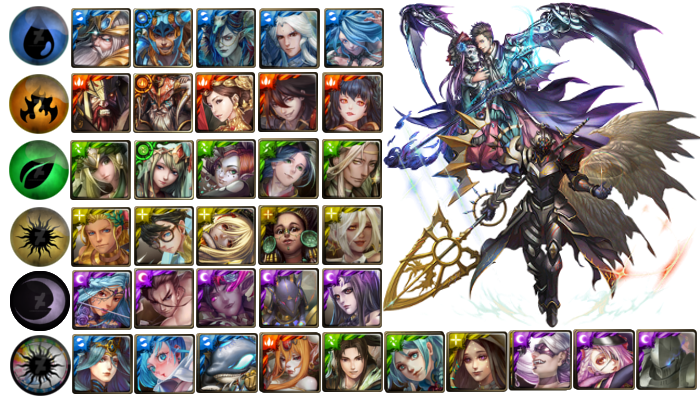 Made a 10 pull and got a surprinsingly good amount of new cards: Abraham, Genie, Jiang Shang, Gondul and Florice. Another 10 pull: New Vali and Maya!! Well as i said the saturday i pulled one, got Suzuko, today i got a nice payday and choose to pull more, and was trolled lol. bah did a hail Mary draw, got another dupe tsuchigumo. getting rid of it, that is a series more worthy of AR than VR if anything at all. Rubish for me, just like the previous black-seal event. Managed to draw 4 times from the ancient seal, I got Satan as the only worthy non dupe card. It's a good card but old and not enough for what it is. I also made a 10 draw, plus some extra individual ones to get enough coins for the fourth ancient-seal chance: two new cards appeared, completely useless ones nevertheless. Meh, I don't even care anymore. I had 28 draws before pulling Maya.